Yesterday I got to participate in Pole Up, LLC of Indianapolis' first Holiday Donation Event benefiting The Cheer Guild of Riley Children's Hospital and Indiana University. 100% of proceeds from the event were donated to the cause along with 15% of all purchases made during the event. 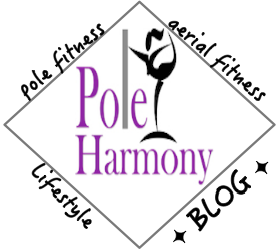 The event offered participants an opportunity to learn three routines and to get a taste of what types of classes are offered at Pole Up- all while supporting a great cause. The evening began with a saucy holiday burlesque routine. The routine was easy to learn and proved to be quite a workout. My favorite part was the use of a silk handkerchief as a prop. The burlesque demonstration was followed by a chair routine which consisted of a wall dance, floor work, and the use of a chair as a prop. The routine was also really easy and flirty. I loved how the routine flowed and so many different elements were incorporated. The last demonstration was a pole routine. The pole routine included a spin, floor work, and some basic dance transitions. All of the participants did really well during the pole routine. I always love taking pole classes, even if they're beginner level curriculum as I am constantly learning something new. That is what makes pole dancing so special. It never gets boring. There is always something to learn to feed my hunger for creativity within my dancing. I really enjoyed participating in the Holiday Donation Event. I found myself walking away with three dance routines and feeling great in knowing that it all went for a special cause. I really hope everyone else had as much fun as I did coming out of the event. The ladies that worked hard to put the evening together did such a wonderful job. I look forward to participating and working with Pole Up in the future for more wonderful events that benefit such amazing charities like The Cheer Guild.